Eating at Joël Robouchon's has always been a fine dining mecca for me. While I could easily visit the one in Singapore, I had jumped at the chance to visit the one in Macau because of two reasons. One, it is not a restaurant I can easily pop in and out of if I want, and I was already in Macau on a self-proclaimed gourmet tour. 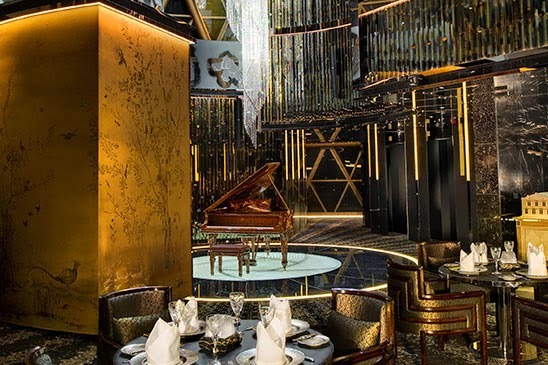 Two, it is actually much more affordable to do a lunch at the one in Grand Lisboa's Dome than have a dinner in Singapore's MBS (more than 300 bucks). The one in Grand Lisboa also offers a breathtaking view of the coast as it sits on top of the hotel, underneath a glass dome (hence the name). Walking into the bright and airy place, you'll be greeted by trays of goodies. There's also a pianist playing pleasing tunes as you enjoy your meal. It really perked up the atmosphere. The dome was encased in a gold structure. I felt like I was in a Faberge egg. Magical. And then we get into the lunch proper. There's the 3-course meal at MOP $498 (83 SGD) for appetizer, fish or meat, cheese or dessert and coffee or tea and confectionaries or MOP $598 (99 SGD) for the additional soup as a course, which is what we took. For under 100 bucks it was a really really good deal! I would easily do this every 3 months if this was available in Singapore. First, a small amuse bouche to start. Creamy, and comforting. This reminded me of the organic egg at JAAN in Singapore. There's also the bread basket, filled with delicious and freshly baked goodies. Each one of them was so good, I wish I could have more, but I had to pace myself. There was even a butter service. Perfectly curled butter for the warm toasty bread. Mmm. Since there was three of us, we all took different appetizers and soups! This way we can try more. That's always a good strategy. First, there was the Le Crabe - fresh crabmeat in chilled tomato infusion with spiced avocado guacamole and perfumed soft-boiled egg. The crab taste was really strong in this! Mixed all together it was a delightful dish to whet our appetites for more. There was also Les moules de Bouchots which is French mussels "marinieres" with a touch of cream and leek fondant perfumed with saffron. I wasn't a fan of mussels, but I tried a little bit of this and found it acceptable! A great choice for shellfish lovers. Onto soups! There was the L’oseille, which is sorrel bouillon to surround the light salmon mousse and perfumed with dill. The mixture of salmon mousse and the herb broth was delicately balanced. And a simple pea soup. It was classically light, almost airy. We then went onto the mains. For that we got to choose either fish or meat. But first, compliments from the chef - La Noix de Saint-Jacques, the typical scallops in “meunières” style with baby artichoke and tomato salsa flavored with basil and Piquillo emulsion. Of all the mains, the l’échine de porc which is pan-fried pork loin neck with charcuterie condiments and Paimpol white bean stew was probably the most normal one. A simple dish done well, but not as impressive compared to the rest. We also chose a light le dos de bar, which is grilled sea bass fillet surrounded with spiced aubergine and preserved lemon sauce. The lemon sauce was frothy and light to act as the perfect foil to the fresh sea bass. And the dish looks incredible on top of tasting great. For some not-so-classic French fare, there was the Le mini burgers, or wagyu beef and foie gras sliders with lightly caramelized bell peppers and potatoes soufflés (additional $90). This was an indulgent but well-made choice. The burgers were super juicy and the wagyu patty made to perfection. I don't think I've ever tasted burgers that are so tiny but so good! This is an unconventional choice at a fine dining French restaurant, but a good one for lunch. Lastly, dessert! We had the really pretty looking lychee jelly with raspberry sorbet. A tart, refreshing end to the big lunch. And we get to choose more desserts from the trolley. Everything just looked so enticing, it was lucky that we already had a lot to eat. Some mille feuille (incredibly flaky and light) and chocolate mousse tart will do. Yummy. And petit fours. They were petit, so it's ok right? Haha. So much fun to be had. I am so glad to be able to dine at what's considered one of Macau's top fine dining restaurant and sample the works of Monsieur Robuchon! I couldn't find any fault with the dishes - everything was made with such consideration and attention to detail. This is what I like about fine dining. Everything is just fine. If there is one French restaurant you have to put on your list when you visit Macau, consider lunch at Joel Robuchon to be on it!